Star Cruises is best known for its Far Eastern itineraries, which -- because it's a Kuala Lumpur-based line and big in the local markets -- provide the most authentic Asian voyage experience. Onboard SuperStar Libra, there are "real McCoy" touches like tatami rooms, sushi bars and Chinese, Japanese and even Indian restaurants. 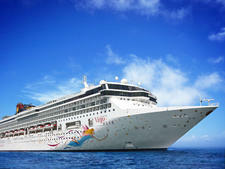 The ship offers short cruises (one to three nights) from Penang, Malaysia to ports in Thailand. And while certainly not the newest or most glamorous cruise ship in the region, SuperStar Libra has a quirky charm all of its own. There are several reasons for this, which will become obvious as this review progresses, but the main one is that the ship's largely Asian crew are simply superb -- friendly, sweet-natured, efficient and very attentive. Indeed, some of our fellow passengers loved the crew so much they were in tears saying goodbye to them as the cruise ended. That's heartfelt praise indeed. Though this ship is marketed primarily to Asian passengers, the official onboard language is English, so North Americans, Brits, Australians and others fluent in the King's tongue are accommodated beautifully. Passengers dress respectably for dinner, but don't tend to go over the top with sequins and tuxedos. By day, casual is fine and the ship is very relaxed, but sunbathers are asked to cover up before going into The Saffron for lunch or tea. Star Cruises operates a "no tipping" policy, but the staff are so lovely some passengers break the rules. --by Maria Harding, Cruise Critic's England-based correspondent, who also writes for The Times of London and The Daily Telegraph. Photo courtesy of Star Cruises.